Mannitol is a low-calorie sugar alcohol that has little or no after taste. The compound contains 50 percent of sweetness found in regular sugar, according to an article posted on the Sugar and Sweetener Guide website. Likewise, mannitol contains 80 percent of calories found in sugar with equal levels of sweetness. Mannitol is poorly absorbed in the small intestine, and is therefore processed in the large intestine where it is converted by beneficial gut bacteria into gases and short-chain fatty acids (SCFA). Once absorbed, mannitol can provide the body with energy. The U.S. Food and Drug Administration (FDA) has classified mannitol under its Generally Recognized As Safe (GRAS) category. 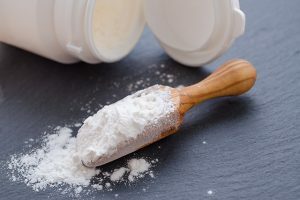 Likewise, the Joint Food and Agriculture Organization/World Health Organization (WHO) Expert Committee on Food Additive have approved the use of mannitol in various applications. An entry published on the Nutrients Review website noted that the sugar alcohol can be found in natural food sources such as mushrooms, strawberries, and celery as well as onions, pumpkins, and marine algae. The compound is recognized as a nonhygroscopic, which means that it does not absorb moisture from the atmosphere. This is why mannitol is usually used as a thickening agent in chocolate-flavored coatings for ice cream and other confections. Mannitol is also used as a sweetener, emulsifier, and anti-caking agent for chewing gum, butter and frozen fish as well as pre-cooked pasta and infant formula. The compound is also utilized in the pharmaceutical industry as a carrier in certain medicinal syrups, medications, and vitamin supplements. Mannitol is particularly beneficial to kidney health. An entry posted on the EZine Articles website noted that mannitol is an osmotic diuretic that promotes blood flow to the kidneys. The compound also facilitates liquid transport through a membrane from a less concentrated to a more concentrated environment. The diuretic effects of mannitol inhibits the reabsorption of water and sodium. Mannitol serves as a renal vasodilator too. This beneficial property helps widen the blood vessels in the kidneys, which in turn reduces vascular resistance, relaxes smooth muscle cells, and promotes blood flow in the organs. The compound is also shown to treat patients who are suffering from oliguric renal failure — a disease characterized by decreased urination due to the kidneys’ inability to filter toxic chemicals. The sugar alcohol is not completely absorbed by the body. This prevents an increase in blood sugar levels and the risk of developing diabetes. Aside from this, mannitol is found to relieve intracranial pressure caused by severe head trauma or injury. The compound is touted to promote blood flow in the brain and facilitate the delivery of drugs that treat Alzheimer’s disease and other cognitive conditions. In addition, mannitol is currently being studied as a potential treatment for cystic fibrosis. The beneficial sugar alcohol is also touted to address glaucoma by providing moisture to the vitreous humour. Doing so may help lessen the pressure in the eye area, the experts say. Mannitol plays a central role in supporting the kidneys and maintaining a healthy urinary tract. Likewise, the sugar alcohol is beneficial in keeping ideal blood glucose levels and promoting the digestive system’s overall health. Mannitol also benefits the brain and central nervous system, the respiratory tract and the eyes. Mannitol addresses oliguric renal failure and other kidney conditions. Mannitol relieves intracranial pressure and prevents Alzheimer’s disease. Mannitol may potentially treat cystic fibrosis and glaucoma. Mannitol supports the kidneys and maintains urinary tract health. Mannitol benefits the digestive tract and the brain and central nervous system. Mannitol may promote both eye health and respiratory profile.